Detox products: The Neck Ring Herbal Aromatherapy Heating Cooling Pack. Pass drug tests, passing all drug test. The Neck Ring Herbal Aromatherapy Heating Cooling Pack is a soothing way to relieve neck & shoulder pain. 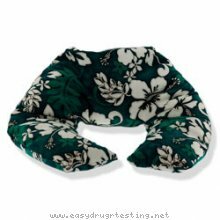 It can be used tight around the neck or loose resting on the shoulder area. Used as a hot pack it can relieve pain, stiffness, stress, and increases blood circulation In the microwave: Heat in microwave for 1 to 3 minutes. (Lighter weight products require less heating time. Eye pillows will require only about 30 seconds). If microwave does not have a turntable, flip Herb Pack over 1/2 way thru heating to avoid burning. For a moister heat: mist with water before heating. Misting also increases lif of herb by preserving freshness. When reheating, if Herb Pack is still warm, heat only for 1 to 2 minutes to prevent overheating. Heat lasts for approximately 45 minutes. Heating for more than 3 minutes at once could result in overheating or burning. If pack seems too hot, leave cool prior to use. In the oven: Heat oven to 350, wrap Herb Pack in tin foil. Heat for approximately 15 minutes. Do not oven heat products with velcro, as velcro may melt. For a Cold Pack:Place in a plastic bag and place in freezer for 1-2 hours. Pack will stay cold for up to 45 minutes!! !